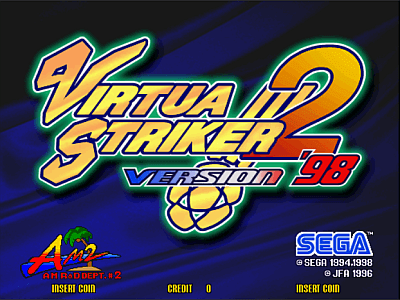 Virtua Striker 2 version '98 © 1998 Sega. Runs on the Sega "Model 3 Step 1.5" hardware. Version '98 was released in May 1998 in Japan. * Selecting MVP Yuki-chan : Go to countries starting with Y, U, K, I and press start twice. A small box will appear at the top left corner then select it by pressing the three buttons. * Rainbow trail on goal replay : During goal replay move joystick up-left and hold start. * Ranking mode : After putting your token, hold the joystick down and then press START. * Virtua Striker 1 background music : Press short pass and start button after putting in the token.